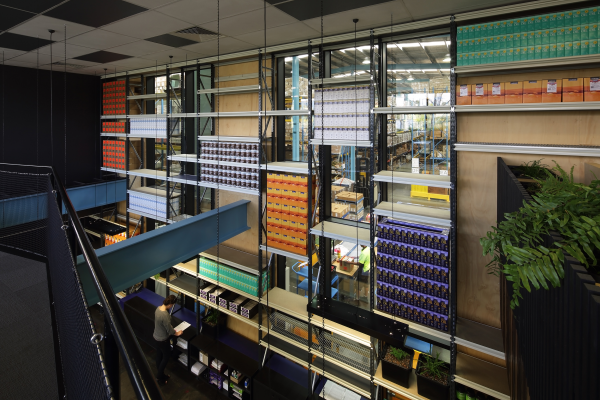 This project involves the transformation of a typically mundane and static office/warehouse building into the dynamic new headquarters for Melrose, a national health product company based in outer-eastern Melbourne. 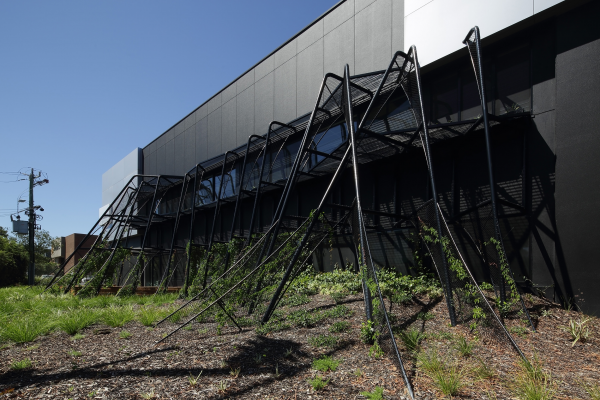 The street façade of the existing two-storey office block was eroded via the introduction of an organic tubular steel structure that literally connects the site’s landscape to the building fabric. Part sun-shade and part landscape arbour, the structure liberates existing north facing windows that would otherwise cower from hot summer sun, and provides a conduit for greenery to permeate the office interior, enlivening the workplace whilst defining diverse spatial zones, including co-working areas, quiet spaces and collaborative ‘landscaped’ breakout zones. The division between office and warehouse was also eroded, creating a more immediate connection between the various operations of the company. 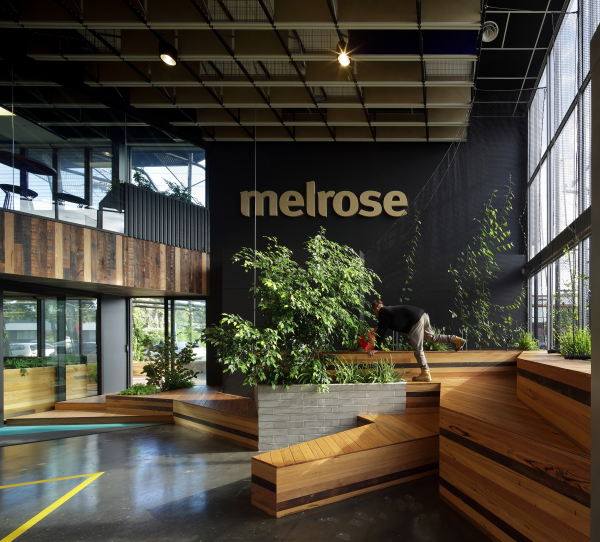 The result is a project that embraces the Melrose ideology of whole body health by creating a workplace that is responsive to the natural environment and engaged with the processes within. This project commenced with fairly humble aspirations; Melrose was being relocated from a smaller facility, and we were to provide its new offices with fresh carpet, paint and furniture. We felt, however, that the refurbishment should do more, presenting an opportunity to reflect the ideology of Melrose, which (in the company’s own words) states; “being well and staying well is all about a whole body health approach to life. It’s as much about taking responsibility for your place in the world as it is about exercise and nutrition… We (Melrose) believe our products should be healthy for everyone, including the planet, and that whole body health is all about taking personal responsibility for living well, with integrity.” So, just as it utilises natural ingredients to create its health products, we felt that Melrose should harness nature to create a healthy workplace for its staff and the environment at large. The facility that it was to relocate to was a typically unhealthy, soulless box, disconnected from the outside and from its warehouse and production facility. Our brief was to create a healthy office that is responsive to the natural environment and engaged with the process within. What is it that you've done that's novel or brings new outcomes to the market? 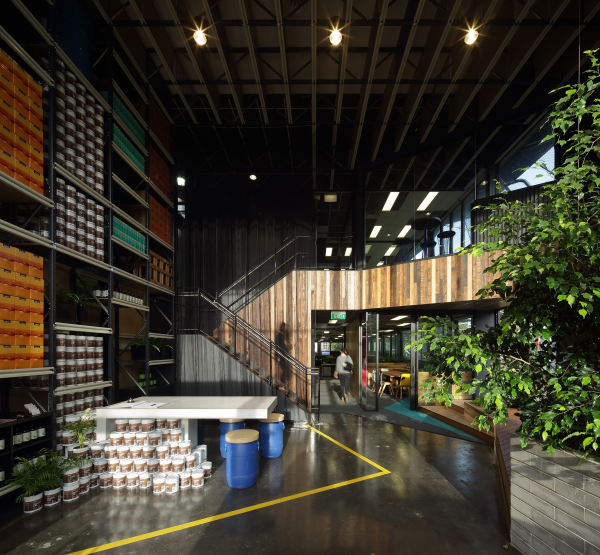 This project transforms a mundane and static office/warehouse building (typical in the industrial estates of outer Melbourne), into an environmentally responsive and engaging workplace which fuses warehouse, administration and landscape into one cohesive whole. By eroding the existing building fabric and redefining divisions within, the project encourages its occupants to connect and engage with the external environment and each other in a meaningful way, creating a healthy workplace that embraces and reflects the ideology of Melrose Health. 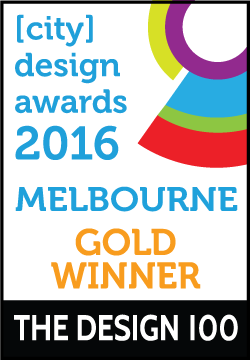 Transforming a fundamentally static and soulless office/warehouse building into a site responsive and engaging workplace that celebrates and reflects the “whole body health” ideology of Melrose in a cost effective and environmentally responsible way was the principal challenge of this project. 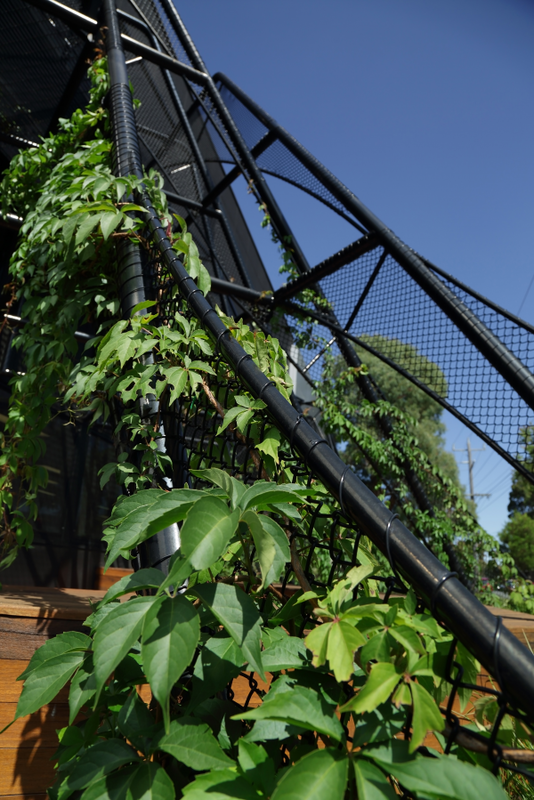 The street façade of the existing building was eroded via an organic steel structure that literally connects the site’s landscape to the building fabric. 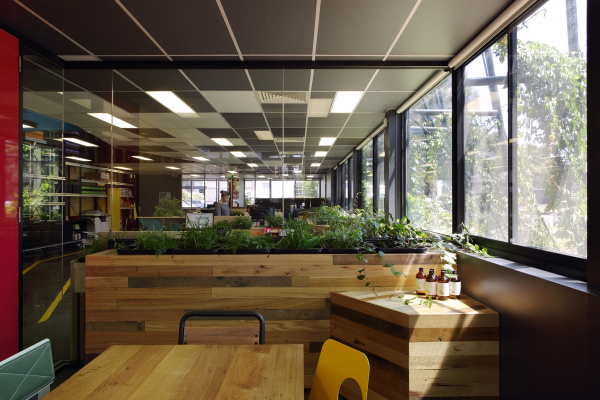 Part sunshade and part landscape arbour, the structure liberates north facing windows that would otherwise cower from hot summer sun whilst providing a conduit for greenery to permeate the office interior. 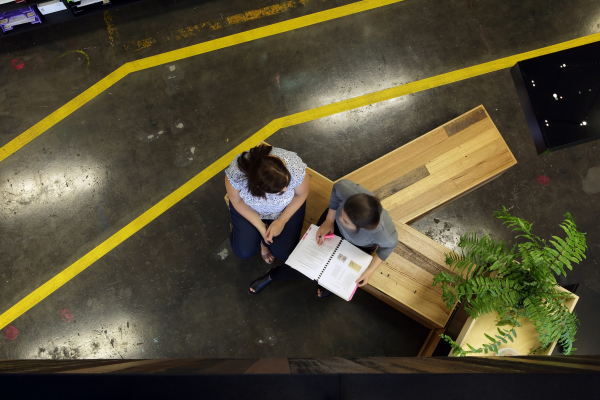 Openable windows were inserted to facilitate natural ventilation, and modular garden beds and joinery components comprising recycled materials and building off-cuts were inserted to define co-working areas, quiet spaces and collaborative ‘landscaped’ breakout zones. 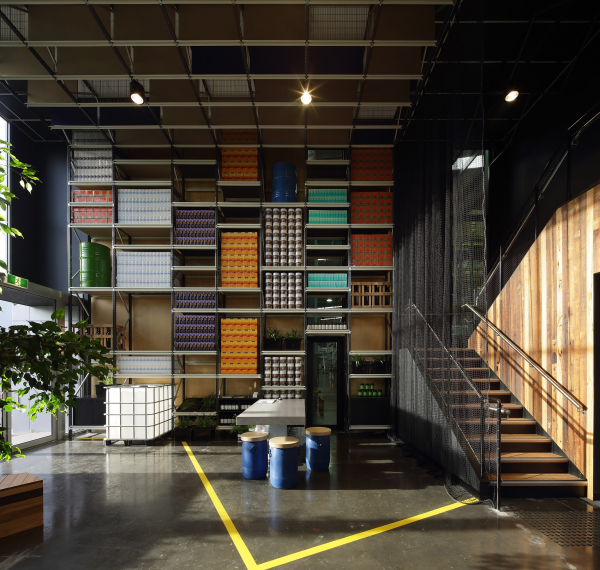 Warehouse palette racking permeates the office interior to strengthen the link between the two typically disconnected spaces. The racking, supporting planters and showcasing Melrose products, extends into a light filled double height foyer where timber lined terraces, a weeping fig, vines and natural sunlight define a space that, on entry, embodies the ethos of Melrose, the products it creates, and the benefits of harnessing nature to promote good health. This project transforms a fundamentally static, refrigerated office/warehouse building into a site responsive and healthy workplace.The street façade of the existing building was eroded via an organic steel structure that shades north facing windows whilst providing a conduit for greenery to permeate the office interior; openable windows were inserted to facilitate natural ventilation. 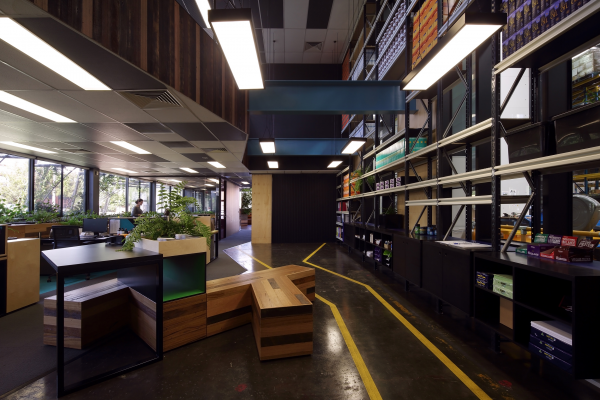 Recycled messmate and EO rated timber boards were used extensively for joinery modules, terrace seating and wall linings; joints were located to minimise material wastage. Work station pin boards were lined with carpet tile off-cuts.Electrical and mechanical services were rearranged to suit the proposed layout, existing ceiling tiles were retained, and the original warehouse concrete floor was exposed. Power and data outlets were retained or relocated. Internal solid partitions were either removed or replaced with glazed alternatives to optimise the spread of natural light. Wet areas were retained in their original state, and existing infrastructure (eg. stairwells and associated handrails), were retained in their original locations. A horticulturalist was engaged to select plants that could respond to both internal and external conditions. Plants were also selected for their ability to survive without the need for chemical fertilisers, in keeping with the sustainable objectives of Melrose.